17062017_The_Rise_Of_Germanys_New_Right_0036: The Rise Of Germanys New Right: Made in Germany: Hermann Bredehorst - editorial and portrait photographer Berlin, Germany. June 17, 2017 - Berlin, Germany: Supporters of the Identitarian Movement shout slogans and wave flags as they march on Brunnenstrasse in Wedding district. 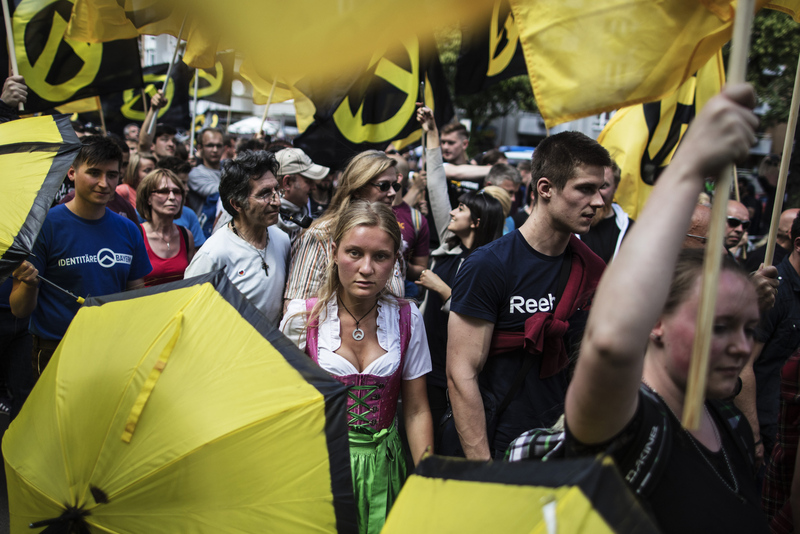 The Identitarian Movement originated in France and with its ideology of a racially-based concept of European identity has drawn right-wing supporters across Europe. The movement has positioned itself against the acceptance of Muslims and Islam in Europe and has also sought to stop immigration from non-European nations.